-Top-quality products make sure that no coarse surface would hurt you. -Eco-friendly and economically, our product does not contain any toxic materials.If you keep recycling the pebbles,it will actually save your money. -Best decoration for garden and yard, with your imagination,you can create a wonderful scenery which you like. Glow pebbles are inedible,please keep it away from children. How to use Glow in the Dark Pebbles? -First, irradiate them for 2 or 3 hours in the sun or under a bright light.When absorb enough sunlight.They will glow automatically. -If you irradiate them in the stronger light for longer time, they will glow stronger and longer. After being in the sun all day, you will have a lovely glowing yard or garden at night. - Put them in your room, after pull down the curtain and turn off the light, you will see them glow softly in the dark, you will get a fairy night. Glow Pebbles: Add a dash of colored light to your walkways, use them as dress up gardens, paths, patios, parties and even aquariums. Easy To Use And ECO FRIENDLY: Harness the sun with beautiful glowing garden pebbles.Just distribute them where you want luminous garden light, and wait for night time - our glowing rocks are brighter and longer lasting than the competition. No electricity required! 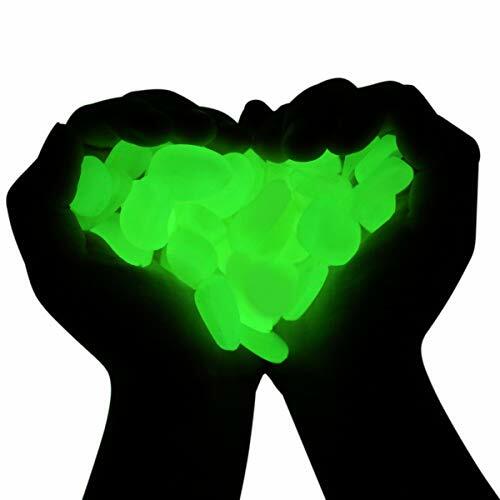 Non-Toxic And Harmless: These glowing resin pebbles are non-toxic and safe to use anywhere, and that includes around pets, children, and even in aquariums. children require supervision. Light up your life with these luminous pebbles in green. You'll be instantly charmed by the magical glow of these decorative glow in the dark pebbles,These luminous pebbles are the perfect way to add that unique touch. Glow in the Dark Garden Pebbles Stones( 200pcs), lasting and bright glow, It can also work indoors as long as there is sufficient sunlight exposure. If you have any questions about this product by MEYUEWAL, contact us by completing and submitting the form below. If you are looking for a specif part number, please include it with your message.